Racing to what and where? The last ten years of my life have been spent married to a wonderful school teacher. I think it’s safe to say we have a good marriage. A big part of that is because I’ve observed her behavior and made adjustments to mine. For example, my wife does not like to be rushed. We will be getting ready to go and things will be taking a little longer than I’d like, and suddenly I’ll get the urge to apply some stimulus to get her to pick up the pace. But this is an urge that needs to be resisted at all costs. You see, a number of things happen when I try to up the sense of urgency. First of all, I am sending a message that she is incapable of realizing that we are about to run late. That assumption irritates her, and now she is trying to get out the door in an irritable state. Now that she’s distracted, things get either half-done or forgotten, which leads to further irritation and the need to back track. That means the car ride to the function is unpleasant and precious time at the function is lost while my wife attempts to shed her irritation. In short, we may get to the party relatively on time, but there is little reward for it. I have learned that once I supply the goal and its importance, I just need to get out of the way. I need to trust in her abilities to be on time. If she’s running late because she is trying to multi-task, I can step and up do some of those tasks so she can focus on getting ready. I can also make sure that I’m not standing around acting impatient and serving as more of a distraction than an expeditor. Experience has taught me that this leads to a much more pleasant ride to the party and valuable time at the party is not lost. It’s better to make sure we arrive then it is to focus on being on time. Last week, I went to a taping of an upcoming public television special on school choice. Midway through the taping, an administrator at a local charter school stood up and emphatically stated repeatedly that her children do not have time. They cannot wait. Every second is vital. Time not spent learning is time wasted. That’s when it hit me. We are treating our children, and our schools like I used to treat my wife. We are demanding so much urgency that they can’t possibly keep up, and then we act surprised when they fall behind. 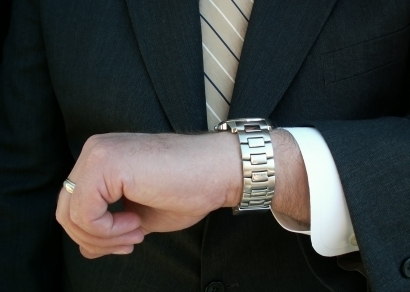 Our schools have become like that spouse standing in the doorway tapping impatiently on his or her watch. Studies have shown that we are currently testing our kids an average of 24 to 30 hours a year, and that number is growing. This does two things: it takes away from instructional time, and it also sets a strict deadline for learning that must be adhered to. We like to say “One size doesn’t fit all,” yet we structure our testing in a manner that all children have to learn at the same pace. Proponents say it holds teachers accountable and raises expectations, but if it leaves no time for meeting those expectations, is that effective? At a recent dinner party, the husband of a school board member and I had a conversation about learning styles. My son is potentially a kinesthetic learner, as his father is, and I was getting some insight into different techniques. It was a fascinating conversation, and I wonder if teachers even get the opportunity to assess children’s different learning styles these days because they are so buried with testing or if not testing, test prep. Experienced teachers have had a lot of training in how to teach a diverse group of students, but because of all the assessing and data monitoring they are forced to do, they don’t have time to spend on what would really help their students. But currently we are more focused on accountability than we are on really helping students. The accountability piece always baffles me. It sets the assumption that teachers and students need outside influence in order for them to be efficient. Little hubris there, no? I especially like when high school dropouts start preaching about setting expectations and billionaires chime in with their insight despite having zero experience. Learning is a natural state for children, and, if nurtured, will blossom into a life of learning. However, like my wife at a party after she’s been rushed, make the process unpleasant and that desire will be muted. The other side of that is that somehow the narrative has gotten out that there is a large segment of the teaching profession who actually has no desire to teach kids. Apparently, if left to their own devices, these teachers would do nothing but plant kids in a corner and eat bon bons all day. Unfortunately for those who wish to perpetrate that narrative, it doesn’t jibe with my observations. Sure there are bad teachers, just like there are bad plumbers, bad journalists, even… gasp … bad professional football players, but the vast majority are dedicated professionals who refer to teaching as more of a calling than a career choice. So-called bad teachers also tend to recognize their own failings, and if they find their skills lacking, either get better or are naturally weeded out. Trust me, 45k ain’t enough to cover the stress and scrutiny of being a teacher if you aren’t committed. Furthermore since we’ve never fully funded our education system nor allowed teacher to fully utilize their acquired skills, are they truly bad teachers or just poorly supported. Teachers are measured in large part by students performance on standard test despite the wealth of data that shows the correlation between poverty and test scores. In fact, schools that score the highest tend to invest the most. But we only like data that tells the narrative that reinforces what we want to believe, so it’s back to the bad teacher narrative. I like to say there are accountability systems and “get things done” systems. Accountability systems are all about making sure we know who to blame. They measure not so much to see what we are accomplishing, but more to see where things fall short and who is at fault for it. A “get things done” system focuses more on accomplishments. It creates a culture of we-are-all-in-this-together, and if we fall short, we are all responsible for fixing it together. Currently, we are operating under an accountability system, and it’s going to cost us. In fact it already is, the current teacher shortage can be directly attributed to our reliance on an accountability system. We’ve been so busy trying to weed out the “bad” teachers, that we’ve failed to create an environment where the “good” teachers can thrive and so they are leaving as well. We need to shift to an accomplishment system and allow the ones who’ve made this their life’s goal to move to the front of the line instead of expecting them to just follow dictates from those who’ve never stood in front of a classroom or just borrowed that space as a resume builder. In the name of accountability, we are failing to utilize our most precious resource, and for those who like to compare schools to businesses, that’s a poor business practice. Our increased testing is tying the hands of the very people who are capable of increasing accomplishment. How can teachers possibly focus on teaching when an endless supply of tests, spreadsheets, and data entries are demanded? Take a music course, and you will learn that part of the secret to playing music is learning to find the spaces between notes and letting them breathe. Currently, we aren’t allowing our students or teachers to find that space, let alone breathe. That needs to change. I find myself wondering, where are we in such a hurry to go? Is there only a finite amount of time people are capable of learning? In architecture, they often talk about the importance of making sure to take time to ensure that you get the foundation right. Shouldn’t the same hold true for education? If tests are so overlapped together, are we even sure that we are getting accurate results? Do teachers have time to make sure students fully grasp concepts before moving on, or do we just make sure kids can pass tests? Again, we need to put trust in those who interact with children daily and trust in their monitoring of student progress. After all, we hire them for a reason, right? People focus on the individual child when it comes to schooling, and there is merit in that. However, we can’t lose sight of the impact our public education system has on society as a whole. Turning out a whole generation that equates learning with testing is going to impact how that society looks. Making the teaching profession one populated by employees from a temporary agency is going to have an impact. We need to ask ourselves, are our actions not only improving the child, but are they also improving our society? My daughter is in first grade, and we read to each other every night. Last night she started reading Llama Llama and the Bully Goat to her brother and me. I was quite pleased with her reading, but every couple of sentences she would stop and question her brother about what she’d just read. I quickly became annoyed and told her to “just read the story.” She replied, “I’m just trying to make it interesting for Peter, Daddy.” It made me pause and think, when did reading stop being about getting lost in the story and making your own interpretations and all about grasping the intent. In essence, when did the magical become the pedestrian and the joyful the practical? Thank you for speaking to this. If you haven’t lived with the day to day intensity of teaching, if you haven’t experienced the passion and devotion required to reach and support a room-full of developing hearts and minds, you can’t imagine how damaging the current policies are for all concerned. Let teachers teach without commercial and political interference. Step 1, get billionaires and their lobbyists out of the legislative process. Their carefully crafted policies have been enormously successful in monetizing public education since the 1980s. That’s why we test, because they make a bundle on it, not because it is good educational practice. That’s why public funds are diverted to for-profit charter schools, that expel students who can’t contribute to their commercial claims and success, and that can fire at will any teacher who questions the corporate curriculum or methods. Our children are suffering and the best teachers are being driven out of what has become an abusive and dysfunctional system just so the 1% can squeeze new profits out of public funds. Parents and teachers must unite to protect children and redress these abuses of public education funding.